Remember yesterday when I mentioned that J is a hunter? Well, I feel like I need to apologize in advance for the inundation of venison recipes that are soon to be here. I’m sure I gave some warning recently, but a couple of weekends ago, he came home with 2 deer so…the time has come. I’ve been menu planning and searching for new and delicious ways to use up all the meat that we have now and that is sure to come during the rest of the season. You see, bow season started in October. That’s where these first two deer came from. Gun season starts this Saturday so…ya know. There will be more. And while we have our favorite ways to eat it, I am always looking for new ways to try it. 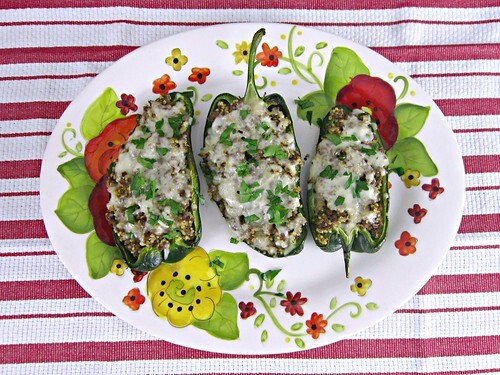 Like these stuffed peppers, for example. The concept is not new, of course, but it was definitely a first for us. And oh how I love stuffing poblanos with deliciousness. And it did not disappoint. 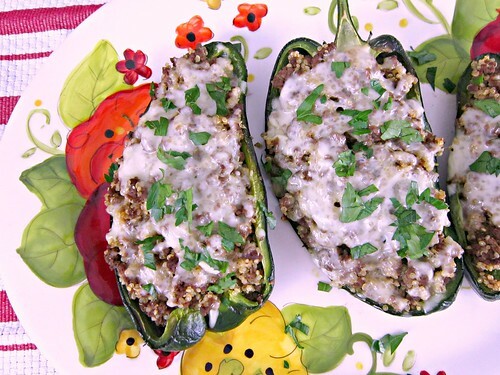 Ground venison and quinoa stuffed in poblano pepper halves and topped with melty fontina cheese. It doesn’t get much better than that, my friends. So, if you have a hunter in the house, the family, or even a generous friend who is willing share some of the goodness, make these peppers. Stat. Preheat oven to 350 degrees, line a large baking sheet with foil and set aside. Cut each poblano in half, length-wise, and remove seeds and ribbing. Place on the prepared baking sheet, cut-side down, and bake for about 10 minutes. Once done, remove and set aside to cool some until filling is finished. Leave the oven on 350. Heat a large skillet over medium-high heat, add the ground venison and cook, stirring and breaking up until almost all browned. Add the vinegar, mustard, garlic powder, thyme, cinnamon, and paprika, and stir to combine. Reduce heat and simmer for about 5 minutes so the flavors can fully incorporate. By this time, the quinoa should be done, so go ahead and add that into the skillet with the meat. Remove from heat and stir to mix well. When the poblano peppers are cool enough to touch, carefully flip them over. Fill each half with a generous portion of the venison and quinoa, then top with a couple of tablespoons of the grated Fontina. Return to the oven and cook about 10 minutes, or until cheese is melted and bubbly. Serve with your favorite hot sauce, if you like! Such a simple dish – but I bet has amazing flavor, because #fontina.